With this startling, bizarre, yet surprisingly funny first sentence, Kafka begins his masterpiece, The Metamorphosis. It is the story of a young man who, transformed overnight into a giant beetlelike insect, becomes an object of disgrace to his family, an outsider in his own home, a quintessentially alienated man. A harrowing—though absurdly comic—meditation on human feelings of inadequacy, guilt, and isolation, The Metamorphosis has taken its place as one of the most widely read and influential works of twentieth-century fiction. Franz Kafka was born in 1833 to a well-to-do middle-class Jewish family. His father, the self-made proprietor of a wholesale haberdashery business, was a domineering man whose approbation Franz continually struggled to win. The younger Kafka's feelings of inadequacy and guilt form the background of much of his work and are made explicit in his "Letter to His Father" (excerpted in this volume), which was written in 1919 but never sent. Kafka was educated in the German language schools of Prague and at the city's German University, where in 1908 he took a law degree. Literature, however, remained his sole passion. At this time he became part of a literary circle that included Franz Werfel, Martin Buber, and Kafka's close friend Max Brod. 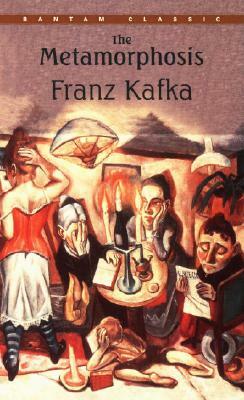 Encouraged by Brod, Kafka published the prose collection Observations in 1913. Two years later his story "The Stoker" won the Fontaine prize. In 1916 he began work on The Trial and between this time and 1923 produced three incomplete novels as well as numerous sketches and stories. In his lifetime some of his short works did appear: The Judgment (1916), The Metamorphosis (1916), The Penal Colony (1919), and The Country Doctor (1919). Before his death of tuberculosis in 1924, Kafka had charged Max Brod with the execution of his estate, ordering Brod to burn the manuscripts. With the somewhat circular justification that Kafka must have known his friend could not obey such an order, Brod decided to publish Kafka's writings. To this act of "betrayal" the world owes the preservation of some of the most unforgettable and influential literary works of our century.